Two Wheel Oklahoma: Are You Ready to Ride? Heading out to discover your own Two Wheel Oklahoma? We often get emails asking about getting started with motorcycling. Our answer is: If you're considering a motorcycle, or have recently started riding, we always recommend taking a rider safety course. And that goes for you old riders that just hopped back on- or what we like to call "born again bikers." An organization called the Motorcycle Safety Foundation has created a curriculum for teaching would-be motorcycle riders the proper way to handle a bike. Their 15-hour Basic Rider Course will give you the fundamentals required to safely operate a motorcycle. The bike and helmet are provided, and the only prerequisite is the ability to ride a bicycle. Many MSF RiderCourse locations also offer courses for scooters, dirt bikes and refresher classes for experienced riders. There is a fee for each course, but some insurance providers offer discounts for riders who have taken a riding course. Here are ten safety tips all car drivers need to know about motorcycles. 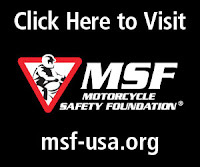 There are several RiderCourse locations throughout Oklahoma- here's a list from the MSF website. For more information or other locations visit www.msf-usa.org.